In March 2013, the Astrophysics Subcommittee of the NASA Advisory Council/Science Committee assembled a group of astronomers and astrophysicists tasked with the goal of coming together and developing a guide for the next 30 years of NASA’s Astrophysics Division. This document dubbed the ‘NASA Astrophysics Roadmap’ outlines what the scientific community believes the overarching goals and aims for NASA science and missions should be for the next 30 years. It builds upon the Decadal Survey which the US astronomical community assembles every 10 years (last one was 2010) prioritizing where they think funding should go and what big facilities and questions should be focused on in the next decade for all ground-based and space-based astronomy and astrophysics. The NASA Raodmap is similar, but sketches out the wishlist and plan astronomers want to see NASA take in terms of research areas to focus on, new technology to develop, and space missions to pursue in the next 3 decades. 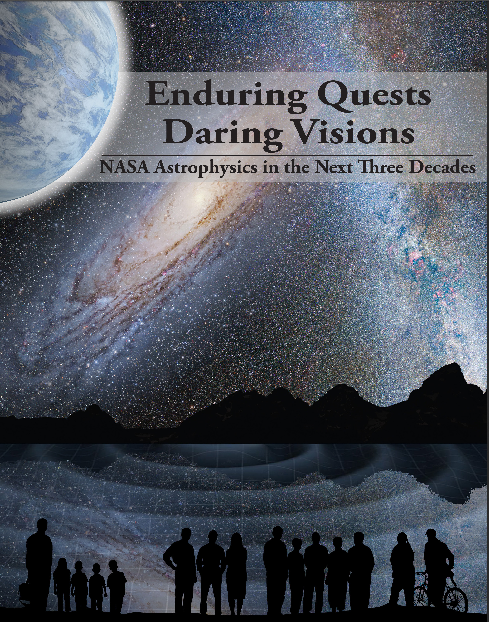 The Roadmap team spent months getting community feedback and preparing this document.The 2013 Astrophysics Roadmap officially titled ‘Enduring Quests Daring Visions NASA Astrophysics in the Next Three Decades’ was released on December 20th. You can read the full NASA Astrophysics Roadmap here. In addition to the mention in the Public Engagement Chapter, Panet Hunters got a cutout figure highlighting the project (shown below) in the exoplanets chapter (Chapter 2: Are We Alone?). The fact that Planet Hunters is featured in the Astrophysics Roadmap is a testament to the impact the project has had in the past three years. Thank you for making Planet Hunters such a success! Good evening Meg & all participants! I start studying one by one in full detail the NASA’s document “roadmap” (link “here”), in order to reclaim as better as i can.